Compasses are fascinating things, with much to teach for being an inanimate object. I’m speaking of course, of an analog piece, little changed for centuries, not the app on your phone. There can be a number of things that affect the proper reading of a real compass, causing one to lose direction. Unlike your phone, a dead battery isn’t one of them. The Tru-Nord pin-on compass. Generally more reliable than I am. Other things in your pocket may be interfering, pulling the needle from true. Take this as a sign that you may have too many things in your pockets, and that it might be time to simplify. Don’t let other things confuse your compass and cause you to lose direction. True direction is the highest priority. It seems inevitable that cheap compasses develop bubbles over time. These too will affect the needle. Don’t trust your life, whether it be your ultimate safety or only your current direction, to cheap things. You’ll get exactly what you paid for. Compasses are only useful when you can see them, and the less accessible they are, the less likely you are to use them. Keep your compass handy and refer to it often. I use mine every time I hunt. Even when I know where I am at all times. Good stuff. Enjoyed this post. It reinforces one of my “rules” for hunting in wild places: never trust your life to anything that operates with batteries. 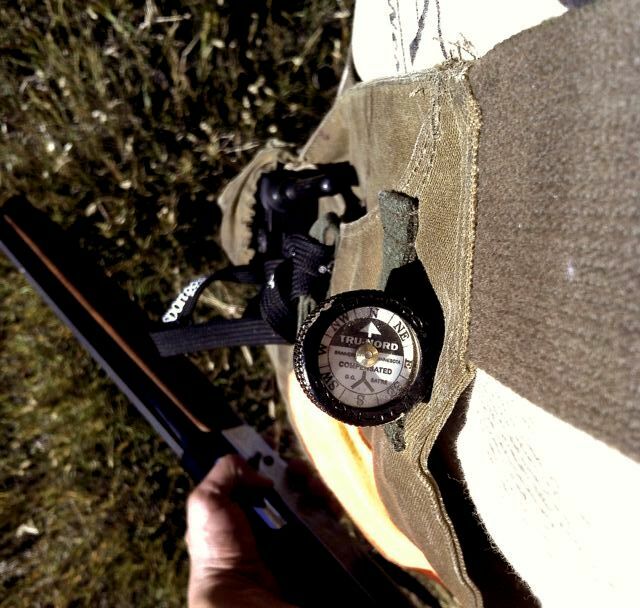 Keep one compass in a pocket and another one pinned on outside of vest where it can be easy checked every few minutes. Even then, on an overcast day in the northern aspen forest where everything looks the same, it’s easy to get disoriented. Keep writing. I enjoy your posts. Last time out in the vast expanse of nearly treeless Nebraska Sandhills, where trees are considered landmarks, my senior hunting partner (I’m 63) and I embarked on a 5 mile plus jaunt for sharptails. As usual, I marked the truck with a way point and we headed off. I’ve hunted this area several times and have a pretty good sense of direction, but the cloud cover, coupled with the fact that sand hills look a lot alike, caused me to check the GPS when we got into a discussion regarding the route back to the truck. Unfortunately, the GPS had dropped the way point (never had that happen before). Fortunately, my partner’s sense of direction was better than my “pretty good” sense, and we circled back exactly on target. My Silva is back in the right front pocket of my hunting vest. Great advice…unfortunately I’m guilty of not carrying a compass when i hunt. This year I got “turned around” a couple of times hunting prairie chickens in the vast openess of the Flint Hills. Going up and down those hills and crossing and walking the “breaks” got turned around causing me to walk in circles. My wife hates hearing that I get lost. Taking your direction and buying a pin on compass this weekend. Also, I”ll start carrying my GPS too.